graze.com will be a familiar name to all the foodies out there; the healthy subscription snack box company has become the best-selling product of its kind in the UK with tens of thousands of users nationwide. 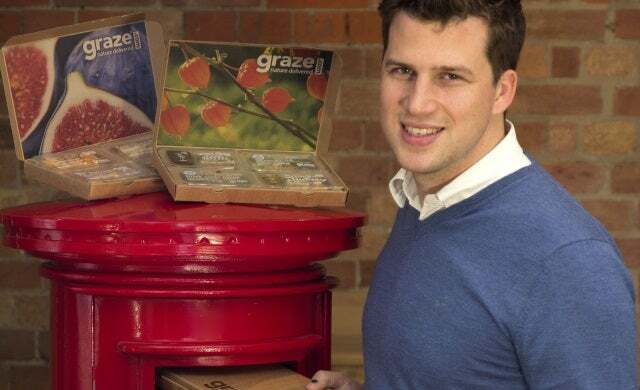 Launched in 2007 by LOVEFiLM co-founder Graham Bosher who adapted his film subscription service concept for the food industry, Richmond-based graze.com is now a £50m turnover brand headed up by CEO Anthony Fletcher. So just how do you build a pioneering snack company? A former executive at Innocent Drinks, Fletcher joined graze in 2009 having “got the taste” for working for a fast-growth business where he learnt “through hands-on experience how to bring a product to market, and then scale it up”. Speaking to Startups.co.uk following a recent talk on being a “silver-spoon start-up”, Fletcher explains that graze.com’s success has been fuelled by a combination of innovation, a team of “inquisitive people”, and a drive to always stay one step ahead of the competition – evidenced by its recent launch into America. graze is now the UK’s leading food subscription brand, what do you credit to the business’ success? “From the outset, graze as a retailer and as a brand has been underpinned by innovative technology. Our intelligent use of data has meant that we can take risks, and be much bolder in our strategy than other blue-chip FMCG companies. graze now employs over 160 staff and you follow “meritocracy of reason” (arguing that those employees who are more senior don’t necessarily know best), instead of a hierachy structure. What advice do you have for building an effective team? “We hire like-minded people. People who are inquisitive, who want to figure out the answer to things, and people who are dogged in their creativity and won’t let their ideas be shot down. How did you approach launching graze stateside and why did you see America as a key market to launch into? “America is the clear front-runner across the world in terms of the size of its snack market, and therefore the size of the opportunity for graze. “We were also wary of a competitor beating us to it and getting too much of a stranglehold on the market; the time was right for graze to get a foot in the door. What did you learn and what “mistakes” did you make on launching in America? “We ran an initial trial over there first to collect all the data we needed to de-risk some of the big questions, and figure out what would be our main challenges. Our trial unearthed a significant problem with the mail network; the US postal system is much slower and less reliable than in the UK. We quickly realised a box was taking two weeks just to get from our distribution centre in New Jersey to Manhattan. “We had to develop our unique ‘Postal Brain’ algorithm to navigate the problem – sending 10,000 dummy packages across the states with tracking barcodes to work out how and when to post. The data we collected helped establish a strong working relationship with the US Postal Service, and ensured our direct to consumer business model was viable in the US. What advice would you share with other companies looking to grow their business in the US? “You’ve got to innovate quickly in America. Utilising our data effectively and cleverly meant we could localise our products along the way, and ultimately correct mistakes faster. You’ve talked about the ability for businesses to position themselves as a safer “silver spoon start-up” in the US, can you expand on this? “The US tech scene is the most competitive in the world, and when recruiting in America, we quickly coined the phrase “silver spoon start-up” to highlight that we were offering all the thrill and buzz of working for a fast-growth start-up, but with a proven model and successful track record at home in the UK. How can we get more businesses to enter the US market? “We just want to keep innovating. In the UK, graze has now launched into retail, and our products are available in thousands of supermarkets across the country.